Elephanta Caves situated near Mumbai in Maharashtra is one of the finest examples of medieval sculpture art and rock-cut architecture. Elephanta Caves are situated on Elephanta Island which is about 10 kilometers away from the city of Mumbai. These Caves glorify medieval rock-cut art, sculptural and architectural art and are included in the list of UNESCO World Heritage Sites. Despite suffering destruction and ignorance during the colonial period, these caves still have the beauty to awestruck any viewer. You can also get an amazing view of the city skyline from there. We have no solid proofs about the origin of the Elephanta Caves. The artists who carried out this wonderful architectural work and made these spectacular sculptures are still unknown. Some believe that Pandavas built these Caves while some say that it was built by the demon Banasura, who was a devotee of Lord Shiva. Local folk says that no men have any hand in building these caves. The name ‘Elephanta’ was given to it by the Portuguese because of the presence of a stone statue of a giant elephant that was situated near the island. These caves suffered major deterioration in the hands of Portuguese till 1661 and then under the British control. After Independence in the 1970s, the Restoration process was carried out but still many caves are in very bad condition. In 1987, Elephanta Caves were recognized as the UNESCO World Heritage Site and since then it has become a major tourist destination. The whole Elephanta Caves covers an area of 60,000 square feet. There are seven Caves. Elephanta Caves include five Hindu Caves which contain rock sculptures of Hindu Shaiva art. The main cave contains Hindu deities carved on the walls and many other sculptures. It has a statue of Ravana while lifting the ‘Kailash Parvat’. The main attraction includes the three-headed statue of Lord Shiva – Trimurti, ‘Ardhnareshwar’ – which represents Shiva and Pārbati in a single body, Shiva slaying the demon Andhaka, Shiva Linga and the statue of Nataraja – Shiva performing Tandav. It also includes two Buddhist Caves. These caves were designed during the 5th and 8th centuries. There origin is still controversial and a mystery for the historians. From any of the stations in Mumbai, catch a local to CST station or Churchgate. Then, reach the Gateway of India. You can also hire a local bus to reach the Gateway of India directly. Elephanta Caves are located on an island which is 10 km far away from the city of Mumbai. You have hired a ferry ride from Gateway of India to reach the island. The timing for the first boat is 9:00 AM and it returns back from Elephanta Island at 12 noon while the last boat that takes you to the Elephanta Island leaves the ferry point at 2:00 PM sharp and it returns from the Elephanta Island at 5:30 P.M. This can cost you around INR 130 to 150 depending upon the choice of boat ride you choose. WHEN TO VISIT ELEPHANTA CAVES. Elephanta Caves are open throughout the year. The months between November and February are best for you to visit these Caves. Avoid going there during the monsoon months (June to August) as the weather becomes harsh and ferry timings get disrupted due to heavy rain. Morning hours are the best time to enjoy the beauty of these caves. 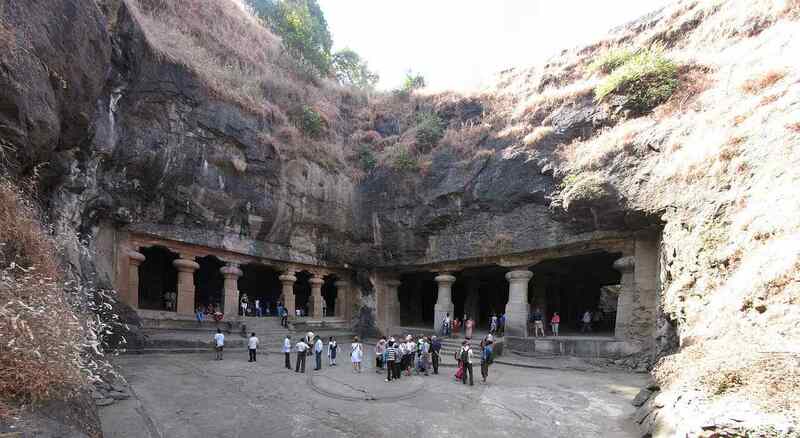 Elephanta Caves are open for sightseeing 6 days a week from Tuesday to Sunday. These Caves remain closed on every Monday. The Entry Fee in comparison to the experience that you get is really very low. You can witness the grandeur of medieval architects for just a meager amount of money. The entry fee for Indians including a tourist from SAARC Countries Afghanistan, Bhutan, Bangladesh, Maldives, Nepal, Thailand, Pakistan, and Sri Lanka is just Rs 10 INR. The entry fee for other foreign tourist is Rs 250 INR. Village entry fee is Rs 10 INR for both Indian and foreigner tourists. Photography is free of cost. But if you want permissions for videography then, you have to pay Rs 25. There is also a Toy Train in the Elephanta pier which you can enjoy by paying Rs 10. It’s optional. Boat Ticket Charges: It can vary from Rs 130 to Rs 150 for two ways, based on your choice of boat. Concessions are available on children’s fare. Elephanta Caves are one of the finest depiction of expertise and perfection of the medieval sculpture and rock art. Most of its parts are damaged but still, it has the power to awestruck anyone who visits it. You can plan a trip to this wonderful place with your friends and family and believe me, it will be a lifetime experience of witnessing the rich architectural heritage of Indian sculptors and rock artists.